The Center for islamic Pluralism offers greetings on Eid Ul-Fitr, hijri year 1433, to Muslims everywhere! May our eid celebrations be happy and fulfilling! CIP recognizes the commencement of Eid Ul-Fitr on the evening of the Gregorian date of Saturday, August 18, 2012, while believers in various regions of the world will begin Eid Ul-Fitr on Sunday, August 19 (in Saudi Arabia and the United Arab Emirates), and in South India on Monday, August 20. During the celebration of Eid we ask humbly for acceptance by Allah almighty of our fasting and prayers. We wish for harmony among Muslims, good relations with other religions and among all human communities, and the gifts of moderation, tradition, and spiritual enlightenment. 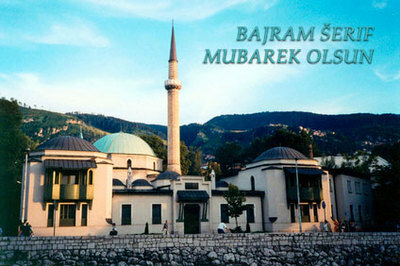 To our Balkan Muslim friends and colleagues: Bajram šerif mubarek olsun! 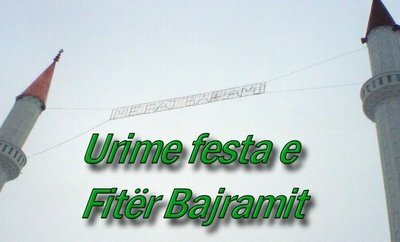 Urime festa e fitër bajramit! The 15th c. CE Careva (Imperial or Sultan's) Mosque, Sarajevo.